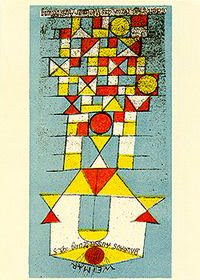 While browsing through the Bauhaus archive site, I was particularly attracted to this postcard circa 1923 by Paul Klee, called "The Bright Side." I found it fascinating because it contained what I observed as elements with different levels of abstraction, which related to what we have learned about Gestalt principles in accordingly various ways. At first glance it - like many of the Bauhaus works we have seen - appears to be a configuration of different colored shapes and lines. Triangles, squares, and circles in yellow, red, and white stand out against a light blue background. Under closer inspection, aspects of the image begin to arrange themselves into discernible figures. We may achieve recognition in respect to the top third of the picture first, because it appears to be the least abstracted aspect. 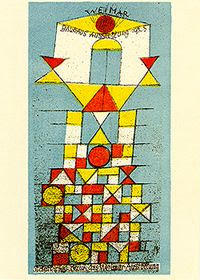 Here, Klee departs from the limitations he imposes upon himself in the rest of the picture to only use triangles, squares, and circles in favor of more complex forms. What emerges from our perception of this rectangular-like shape appears to be a building or temple, with the double blue rectangles in its center representing the doors, the yellow lozenge shape at its top representing the roof, and the the words "WEIMAR" at its top and "BAUHAUS" below indicating its identity as a structure related to the Bauhaus School in Weimar, and perhaps even the Bauhaus School itself. That this portion of Klee's postcard is less abstracted guides our attempt to decode the rest of the picture. As I studied them, various interlocked shapes below the building began to fuse into something like a stacked tower on top of which it rested. An interpretation that dispenses with the traditionally Western desire to see objects depicted with perspectival realism could find, in place of the tower, a long pathway leading up to the building's front door, with the variously colored shapes standing in for different colored stones that one might find in an old-fashioned street. The high level of abstraction in this part of Klee's picture allows us to manipulate it quite freely, seeing it alternately as a pathway and a tower, while still being able to mentally reduce it to its most basic, abstract elements. It takes more work to reduce the building, which Arnheim would identify as possessing the essential structural skeleton that allows our minds to quickly process and understand it, despite the fact that it does not realistically resemble any building that we know of. A more complete abstraction of this aspect of the image may be obtained by turning the whole thing upside down. Seen in this way, the structural skeleton of the building becomes invisible and the words surrounding it illegible; thus we can't see it as anything but a purely abstract collection of shapes. "Why Should Artists Strive For Balance?" I was most interested in Arnheim's discussion of balance and the human mind. As human's we strive for balance. Human's want to place the subject in time and space. We seek organization. Arnheim comments that in order for an artist's statement within a work to be "unambiguous," the artist must strive to balance and stabilize the various visual forces that are present in the work. An artist must present something balanced in order for in to be perceived properly? Balance is desired in all aspects of life; physical balance and mental balance. "Balance remains the final goal of any wish to be fulfilled, any task to be accomplished, any problem to be solved. "(Arnheim, 37) Stress or tension is placed on the system when things are not at balance. This is an interesting way to think about the idea of balance in art. In relation to Freud's "pleasure principal," when one is presented with something unpleasant or the thought/memory of something unpleasant one will do whatever necessary to alleviate that discomfort or tension. Similarly, when looking a piece of art human's will do all that they can to organize the visual information that they are receiving. Both the artist; in making the work and the viewer of the work are participating in attempt to reduce tension, organize, and find equilibrium. Is the universe's desired state a stabilized one? Why would humans strive as they do to equalize things if that were the case? Arnheim says, we are "waging an uphill battle against the universal law of entropy." Why do we strive as we do? Why is balance so important to us? I once read somewhere that the most symmetrical faces are considered to be the most beautiful, but I suppose that that could lead to a whole other discussion on aesthetics and perception of beauty. Something in the reading that also stuck out for me was the discussion about the visual experience and it's relationship to the physiological. Each visual stimuli has its own "physiological counterpart." In order to have the full visual experience there must be an interaction between all the parts of the visual system. There are different forces at work as well. How does the viewer perceive these forces; pushes and pulls? They are inherent in the visual patterns of the object being perceived. I enjoyed the discussion of "Madame Cezanne in a Yellow Chair." Perception is highly affected by use of light, color and the subject's focus. Each aspect of the painting could be unbalanced individually, but all together they give the painting a balanced structure. The notion that there are steps to perception, an action that feels like a seamless process, intrigued me. In Arnheim’s first two chapters on balance and shape he is continually returning to this idea that perception is indeed separated into parts. As a Gestalt psychologist, however, he also believes that the whole of perception is different than just the sum of these visual and intellectual steps. One of the most interesting divisions Arnheim makes is the difference between a perceptual operation and intellectual operation. He asserts that many things are not a “product of intellectual abstraction but a direct and more elementary experience” (pg 35). In other words we see a triangle and are able to distinguish the “triangularity” of it before we can intellectualize that it is a triangle. Or as Arnheim puts it “the young child sees ‘doggishness’ before he is able to distinguish one dog from another” (pg 35). After the initial perceptual operation we begin the subjective intellectual operation. In chapter two Arnheim discusses the impact of memory on this part of perception. When we perceive something it is compared against our vast past visual knowledge. An example of this is when we see someone who we don’t know or have just met for the first time but they strike us as looking like someone we know. We are trying to fit their facial patterns into a familiar schema. Also, in ambiguous situations of balance or shape this intellectual processing must come into play. But we need both to form a comprehensive whole. While these various stages of perception are occurring forces, both psychological and physiological, are acting on the brain. I thought this was particularly interesting. I’ve never thought of there being actual physical forces at work in the brain mainly because I don’t feel them at work when I perceive something. After reading these first two chapters I understand why Arnheim approaches them first in his book and I feel that perhaps reading these before delving into color would have helped solidify my understanding of perception. As an artist and designer I’ve explored the properties of Balance and Shape that Arnheim explains in these chapters almost subconsciously. Like any artist, I’ve intuitively known, to a certain extent, what was “right” or “wrong” in the composition of my work. But I had never thought about it in terms of psychology and visual perception. It was always a matter of creating an image that was visually accessible---not necessarily a harmonious or appealing image but one that the viewer could take in naturally. Until this reading, I never knew of any psychological explanations behind an artist’s or viewer’s desire for clear, visually palatable works of art. I immediately related to Arnheim's explanations of our visual sense of balance, weight and symmetry. He's laid out visual challenges in their simplest form that artistS and designers are constantly running into. How does one place the black disk in the correct part of the square so that it is centered or off-centered enough to make sense to the viewer? Where do you place the doors and windows in the wall of a house so that your statement as the designer is clear? I'm not advocating for strictly formulaic, symmetrical art and design. But aesthetic choices, whatever they may be, must be made clear to the viewer for the piece as a whole to be accessible and effective. As Arnheim put it, this lack of clarity "makes the visual statement unclear and interferes with the observer's perceptual judgement"( page 14). We run into the same esthetic challenge on page 22 in figure 7b. In this image, "The proportions are based on differences so small that they leave the eye uncertain whether it is contemplating inequality, symmetry or asymmetry, square or rectangle." This uncertainty, unless it is part of the designer's statement, is a prohibitive distraction that viewers have a hard time moving beyond. I think some of the other visual functions explained in these chapters feed into this notion of visual accessibility as well. On page 67 Arnheim describes our tendencies to “level” and/or “sharpen” what we see. He compares classicism to expressionism and briefly describes how the former appeals to our capacity to level and the latter to our capacity to sharpen or heighten the tension. The two styles are radically different but the aesthetic choices and their visual and psychological effect are clear. I don’t mean to suggest that certain types of art or certain styles are “right” or “wrong.”I also don’t think that artists and designers should shy away from subtly and nuances. But I think one of Arnheim’s points is that a work of art, no matter the content, or style or subject or medium, will sink in better on a strictly visual level, if it displays clear esthetic choices. Our brain does not want to see ambiguously balanced, or ambiguously ordered or ambiguously complex images and I think artists intuitively don’t want to make such images. I found one of the most interesting elements of this weeks reading in Arnheim’s discussion of balance and the interactions of part and whole. Arnheim says: “Whatever happens at any one place is determined by the interaction between the parts and the whole”. As we discussed last week, the juxtaposition of certain colours will alter how we perceive them. This is however, is not limited to the perceptive neurological responses that we discussed when focusing on color, or even to Arnheim’s examples involving the balance of shapes. As Arnheim points out: every visual experience is embedded in a context of space and time- not only by neighbouring objects in space, but events that precede it in time as well as the wishes and fears of the observer. I found this extremely interesting alongside the more physiological readings of the past weeks. It seems very important to look at both of these angles in order to get a full understanding of how complex our perceptive system is. It is amazing how the brain can, in a flash, integrate the high and low level perception into an understanding of one’s surroundings. Visual agnosia, or the inability to grasp a pattern as a whole, was an interesting example of how the brain can be missing certain parts of this delicate equation, with an unimaginable result. I have consistently found these discussion of the various deficiencies with their multiple sources and results very intriguing. I find Arnheim’s explanations extremely thought provoking, but somewhat lacking in the description of the more subjective processes. Granted, it is much more difficult to taxonomically define more subjective processes. My discomfort however, probably arises from my lack of experience in the field of psychology and my background in politics, aesthetics and economics. In these fields I have developed an understanding of the world that perceives an individual’s subjective reality as the effects of man-made structures and institutions. These structures arise out of historical processes and are maintained by certain assumptions that are embedded culturally and transmitted through dominant paradigms. Thus I have a bit of trouble simply viewing perception in such an objective and categorical frame work.